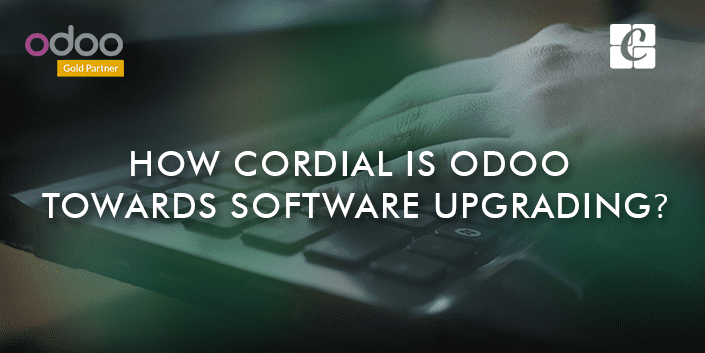 How cordial is Odoo towards software upgrading? We know real-world models are the foundation of modern technology. When the real world changes, the technology also demands possible alterations. This acts as part and parcel for a software life cycle. For a number of reasons, this can remain as brainless strategy, which highly impacts on security, performance, productivity and real-world changes. Thus upgrading a software can easily lead to enhanced network security, an increase in productivity, improvement of morale, and lower costs. Here in this blog, I enlist the pros in upgrading your software and how much Odoo is friendly towards the same, keeping them abreast with the latest changes and demands. The new software improves the ability to remain unchanged over time and different conditions. Advancing through multiple version changes, the software itself becomes more trustworthy among its users especially towards error correction and keeping abreast of changes within technologies. Overcoming the negatives and shortcomings of previous versions and thereby fully utilizing latest functional tools, developers are equipped with maintaining a well-structured format in both coding and functional area in a new software. Of course, every software is equipped with new additions expanding the potentialities and functionalities of the software. Most of the vendors give free upgrades and some may charge a very small amount. The amount will be considerably cheaper than the new version price. Hardware replacement is common in all systems. A hardware communicates with OS with the help of hardware driver. There exists a high degree of possibility on a hardware failure in an old software. User Interface keeps changing with modern technology. Newest versions of any software come up with enhanced and quality user experiences. In the era of smart work, don’t waste your time working in an old software. As technologies changes, the support and maintenance of old versions become tough. It is a common scenario today that most software vendors do not entertain or literally stop the customer support for an old software. How much Odoo is friendly towards up gradation. Odoo online versions are always on the latest versions, no demand for further upgrades. Once the process gets completed, the user is enabled with the latest migrated database. All you need to do is test the DB on target Odoo server and report any test issues to upgrade@odoo.com. They enable you to solve any issues in connection with migration script and thereby deliver the latest migrated database. Once the issues get resolved after tests, again upload an up-to-date DB to Odoo for getting a final database for production purpose. Mostly, Odoo version has no restriction on PostgreSQL version. But it recommends updating your Postgres too. The user can restore them within production environment directly. Custom modules are no longer supported with target version by issues in code compatibility. Here, the user can contact either an Odoo S.A or an Odoo Partner to help you out with code Upgrade. In Odoo Community Edition, Database migration is not covered because of its complexity. In this case, if a user insists, for migrating some tables to the new version, just export them in a CSV file and later import them in the target Odoo choosing the right columns. Also some of the open source projects like “Open Upgrade” helps you in making up-gradation and configuration easily. In community edition, Custom module up gradation is little complicated comparing to an enterprise version. Because the community user wants to use more of custom modules than an enterprise user. In that case, only a top-rated Odoo Partner can help the user.